Mont Sainte-Victoire seen from Bellevue, 1885-87 is another panoramic view, of a delicate, tranquil beauty. Admirable is the thought of opposing to the distant landscape the high tree in the foreground, a form through which the near and far, the left and right, become more sharply defined, each with its own mood and dominant. Breadth, height, and depth are almost equally developed; the balance of these dimensions is one of the sources of the fullness and calm of the painting. We experience the vastness of the space in the broad valley with the viaduct; we feel the equivalent depth in the long, endless passage from the house in the foreground to the mountain top; but we also measure the great height of the space in the central tree which spans the whole vertical dimension, crossing every zone of the landscape and reaching from the lower to the upper edge of the canvas. The contrast of the vertical and horizontal is tempered by the many diagonal lines which are graded in slope through small intervals. The central, almost vertical tree is one of a series of trees more or less tilted, and the most inclined trunk approaches the slope of the mountain and the strong diagonal of the road. But this road, too, resembles in its sinuous form the long silhouette of the mountain, which in its lower ranges and foothills gradually settles into a pure horizontal, like the distant viaduct. The transition from vertical to horizontal through many small changes of axis is like the gradations of color which span the extremes of warm and cool, light and dark, in tiny intervals to create the opaline delicacy of the whole. With so many diagonals, there are none that converge in depth in the usual perspective foreshortening. 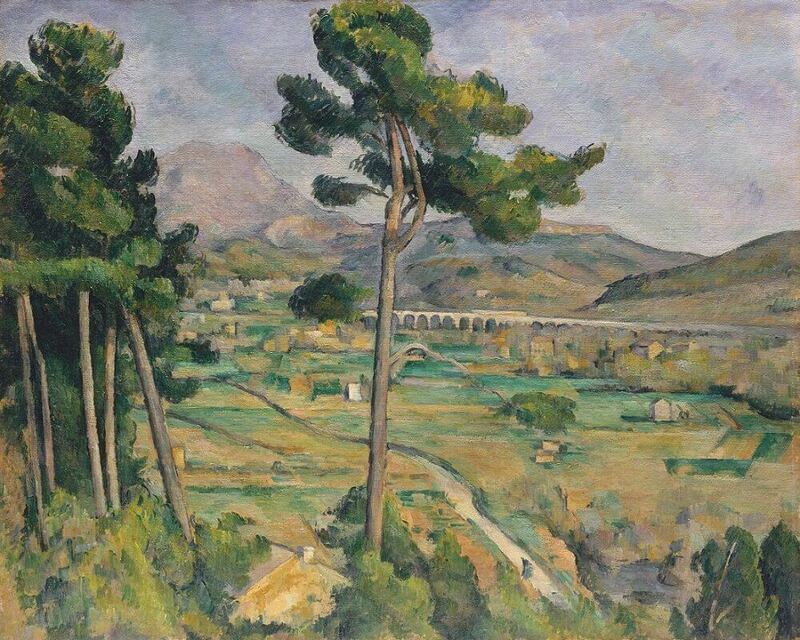 On the ground plane of the landscape, Cezanne selects diagonals that diverge from the spectator towards the sides of the canvas and thus overcomes the tension of a vanishing point, with its strong solicitation of the eye. In the roof in the foreground, he has run together the gable and ridge as a single slope, parallel to the diagonal paths, in defiance of perspective rules. The depth is built up by the overlapping of things and through broad horizontal bands set one above the other and crossed by the vertical tree and the long diagonals. The play of color contrasts is also a delicate means of evoking depth. The same deep green in the foreground plane of the tree is contrasted with a strong ochre below and the light vaporous blue of the sky above. Reddish tones on the upper tree trunk pick up the rose of the mountain peak, but are set against a darker blue tone than the sky. The contrast of warm and cool shifts gradually from the foreground couplings of green and yellow to distant couplings of blue and rose. The brushwork is among the essential beauties of this painting and is worth the most careful attention. It is perfectly legible and frank, a sober, workmanly touch - and through its countless shiftings of direction and size is a lyrical means, sensitive to the tiniest changes in the visual stress of the forms and colors, their modeling and accents.